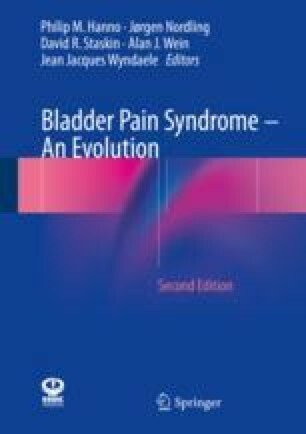 During the last 30 years, a number of treatments and management algorithms have been developed and applied in the treatment of patients with Interstitial Cystitis/Bladder Painful Syndrome (IC/BPS), and many behavioral, dietary, interventional, pharmacologic and surgical therapies have been developed in the attempt to control the disease and to offer substantial benefits to the affected patients. Nevertheless, the complexity of the disease in terms of aetiology and pathogenesis still has made it difficult to induce significant and long-lasting benefits for any kind of these treatments. In addition, few well designed, randomised controlled trials have been conducted until now on different treatment modalities, and this still precludes the development of evidence-based management strategies. Indeed, the majority of pharmacological agents used to treat patients with IC/BPS are still off label. In this respect, the Interstitial Cystitis Data Base study noted >180 treatment modalities for IC/BPS, with poor results in the majority of cases . To date, there is general agreement on the use of some agents, orally or intravesically administered, as indicated by the EAU guidelines on chronic pelvic pain  and the AUA Guidelines for the Diagnosis and Treatment of Interstitial Cystitis/ Bladder Pain Syndrome .